IP address filtering, or whitelisting, lets you grant access within specific IP address ranges. Once filtering has been turned on, access to apps in that realm is denied if a computer is not in the IP address range specified in the filter. Even realm administrators must sign in from the internal network. The only exception to IP filtering is app managers, who can still sign in to their apps from anywhere. On the My Apps page, click Manage name_of_realm, and then click Policies. 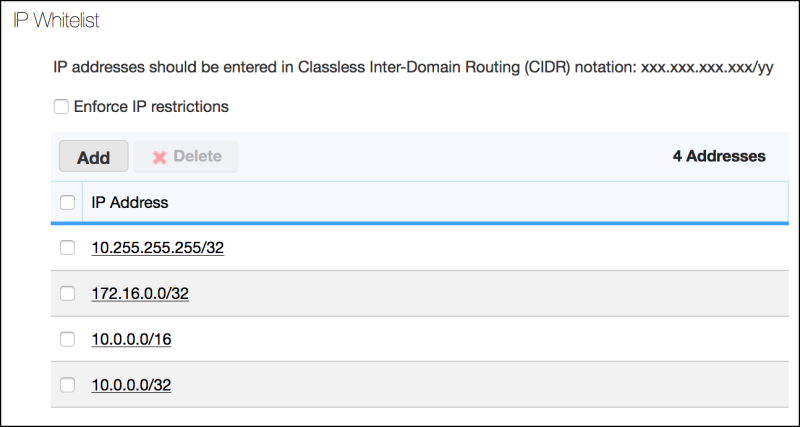 In the IP Whitelist section of the page, use the Add button to enter IP addresses in Classless Inter-Domain Routing (CIDR) notation. If you want all apps your realm to be limited by IP address, select the option Enforce IP restrictions. Leave this option blank to manage access in settings for individual apps, and follow the steps in the section below, "Filtering access to an application by IP address." Click Save at the top of the Policies page. With the option Enforce IP restrictions set to off (not selected), app managers can enable IP filtering for individual apps. In the Advanced Settings - Realm security options section, select Only users logging in from "approved" IP addresses may access this application. Note: This selection is disabled if the option Enforce IP restrictions is set in realm policies, because the setting isn't needed for individual apps.